"Ammons seems expecially vigorous when he's teamed with Stitt. The musical exchanges between the two most often took the form of a good-natured blowtorch duel." In the November 27, 1969 issue of Down Beat, there was a news item which gladdened many a jazz follower. Wrote Down Beat, in part: "One of the giants of the tenor saxophone is finally back on the scene. After serving seven years of a harsh 15-year sentence on a narcotics charge, Gene Ammons was released from Statesville, Ill. penitentiary in mid-October." Twelve days later, Ammons led a small group for a two-week engagement at the Plugged Nickel, in Chicago where, according to the jazz magazine, he received a standing ovation and "preached some sermons that proved him still the king of soulful tenors." A few days after he had ended his comeback engagement in Chicago Ammons was once again in familiar surroundings, this time a recording studio, celebrating his return to Prestige, the label of many of his past musical accomplishments. In view of the fact that he has been away from the scene for an extended period, it would seem in order to take a backward glance at the career of Eugene Ammons. He was born in Chicago, April 14, 1925, the son of Albert Ammons, the famous boogie-woogie pianist. In 1943 he went on the road with trumpeter King Kolax (Kolax was also a member of Ammons' group during the aforementioned date at the Plugged Nickel) and he joined Billy Eckstine's band the following year. It was during his three years with Eckstine, that Ammons began making a name for himself. In 1947 he made his first records as a leader, for the Chicago-based Mercury label, the same label that recorded his father. Two years later he took over Stan Getz's chair in Woody Herman's band and, in 1950, he became co-leader of the Gene Ammons/Sonny Stitt band, recording for Prestige. This association lasted until 1952 and has been preserved on a number of fine recordings, many of which feature tenor "battles" between the two leaders, which did much to make the band popular. Although Ammons has been on his own since the break-up of the Ammons/Stitt Band, the two men have frequently been reunited in club appearances and on records. A disciple of the late Lester Young, Ammons, by the early '50s, was playing in a style which was less restrictive than that of most Young followers, a style that one might place somewhere between that of Stan Getz and the late Wardell Gray. "Jivin'" [mp3] from 1962 with Howard McGhee. He also went through a period of playing in the rhythm and blues vein, as did many of his contemporaries. The development of rock to its present more sophisticated state and the apparent head-on courses of both jazz and rock have taken place since Ammons' involuntary hiatus. "There have been a lot of changes in this world since I went in," he told Down Beat, "It's like day and night. These changes have struck music too. Dudes are trying new directions and I dig it. But the avant garde wouldn't fit my bag. I might try a free lick here and there, but I'll stick mostly to the Gene Ammons I know." That Gene Ammons is, of course, the one we know and this, his first set of recordings in seven years, not only demonstrates that the old, familiar "Jug" is back, but also that he hasn't lost his touch. "There's only one thing I can say for sure," he told Down Beat after his recently won freedom. "Put me down as saying I'm here to stay." The Boss Is Back, Prestige. 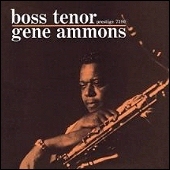 A selected discography of Gene Ammons albums. Blues Up And Down, 1950, Prestige. The Happy Blues, 1956, Prestige. 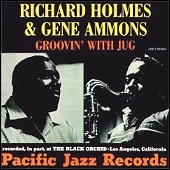 Groovin' With Jug, 1961, Pacific Jazz. Bad! Bossa Nova, 1962, Prestige.